Though I wish I could go to ALA and their Midwinter meeting, I am always happy to watch the YMA announcement in my pjs! Below are this year’s results. Winners get cover art. I compiled this from ALA’s not-so-pretty-to-look-at press release. Newbery- Most outstanding contribution to children’s literature. It went to a picture book… that also got a Caldecott honor… and a Coretta Scott King Illustrator honor! This was the only big surprise to me this year. Coretta Scott King (Author) Book Award- recognizing an African American author and illustrator of outstanding books for children and young adults. Schneider Family Book Award- books that embody an artistic expression of the disability experience. This award has a winner for each age division. Laura Ingalls Wilder Award- author or illustrator whose books, published in the United States, have made, over a period of years, a substantial and lasting contribution to literature for children. May Hill Arbuthnot Honor Lecture Award- recognizing an author, critic, librarian, historian or teacher of children’s literature, who then presents a lecture at a winning host site. Mildred L. Batchelder Award- an outstanding children’s book translated from a foreign language and subsequently published in the United States. The War that Saved My Life, produced by Listening Library, written by Kimberly Brubaker Bradley, and narrated by Jayne Entwistle. Echo produced by Scholastic Audio/Paul R. Gagne, written by Pam Muñoz Ryan and narrated by Mark Bramhall, David de Vries, MacLeod Andrews and Rebecca Soler. Stonewall Book Award- Mike Morgan & Larry Romans Children’s & Young Adult Literature Award given annually to English-language children’s and young adult books of exceptional merit relating to the gay, lesbian, bisexual and transgender experience. This award had two winners. This is a short clip from the 2015 ALA Annual Conference that just wrapped up in San Francisco. Joshua Davis suggests that libraries have a wonderful opportunity to fill the gaps in education by providing informal hands-on educational opportunities. I couldn’t agree with this more. This is what I call “finding a hole and filling it” in your community. Public libraries should NEVER feel or be treated as though they are obsolete or irrelevant. We are in a unique position to offer just about anything our community requires. Community space. Unique collections. Local history. Entertaining and educational programming. Within our (albeit sometimes severe) financial constraints, the sky is the limit. via 2015 ALA Annual Conference – Joshua Davis on Libraries and Oppurtunity – YouTube. Clearly, the image links suppression of information with the religion of Islam, depicting a woman whose eyes are showing through her niqab. No one denies that there is suppression of information in a number of countries where Islam is the national religion, but this image implies an identity between the religion and the practice of censorship. I think most of us can think of some American muslims who would take offense at that. Perhaps they are even members of the American Library Association. This poster uses undeniably Islamophobic imagery of a woman in traditional Muslim clothing. It should be removed immediately from the ALA Graphics store, and the ALA Graphics Store and Office of Intellectual Freedom should apologize and explain how they will prevent using unethical imagery in the future. Let the ALA leadership and Graphics Store know that this poster violates the ALA Code of Ethics, represents libraries and librarians as discriminatory and non-inclusive, and must be removed immediately. I have seen so many widely varying ideas about this image. Some people see a woman wearing a niqab. Some see a woman looking through a Do Not Enter sign. Unfortunately, I did not see the poster outside of the debate so I cannot say what I would have thought of it on its own. 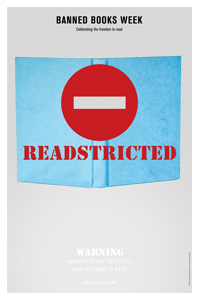 What I can say is that I don’t care for the term “Readstricted” as it trips my eyes up. I had to say it aloud a couple of times to make it work for my eyes. And I would have chosen a different color for the cover of the book. But those are design issues. As Agnostic, Maybe points out, the ALA store is also selling a downloadable poster that you can edit to put yourself in the image. Seeing it this way certainly does change the image for me quite a bit. 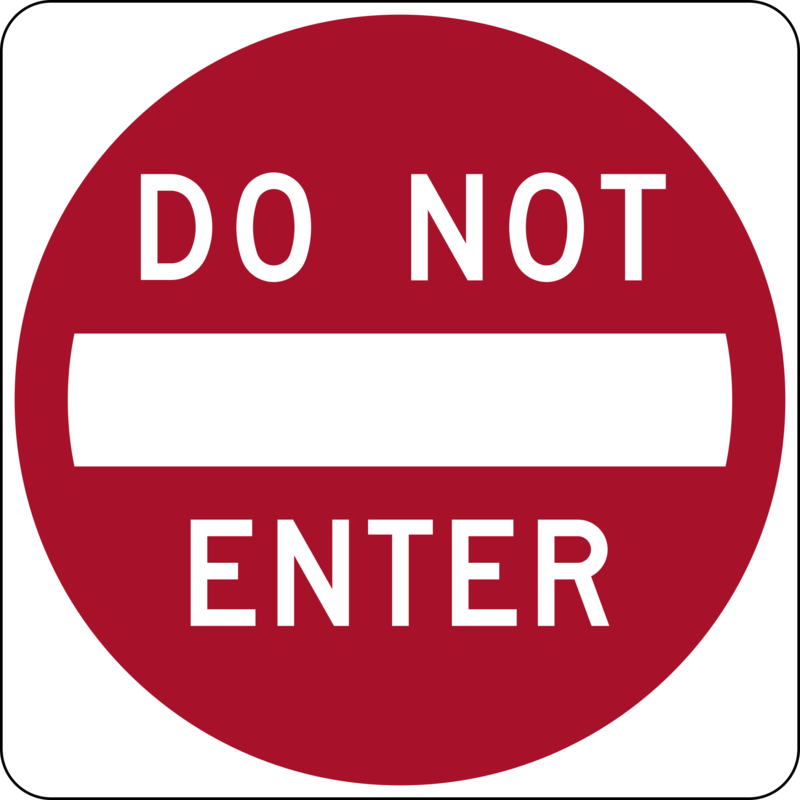 It is more obviously a Do Not Enter sign. Overall, the big issue seems to be intent. What were they trying to do here? If the intent was as speculated, then many are wondering how many saw this in production and how no one thought this might be a bad idea. Perhaps it was just a design blunder? And if the intent was as speculated, then the statement is that having access to books information can transform and enlighten. I suppose it is a question of what you feel it means to be enlightened. That is a much bigger discussion for another time. I am not a member of the community in question so I don’t feel I have the right to be offended for them. We are aware of the comments about this year’s poster for Banned Books Week. We appreciate and respect the concern expressed by the commenters on behalf of the individuals and communities served by their libraries, as well as the concern expressed for the association’s work on behalf of diversity and intellectual freedom. We take to heart any distress we may have inadvertently caused anyone. The poster was never intended to offend or shock, nor was there any intent to include any ethnic or cultural stereotypes. The aim of the campaign is to employ the universal signage for “Do Not Enter” – a red circle with a bar across it – as a visual proxy for book censorship. It is not a head covering. We attempted to embrace diversity by including a person of color – which, combined with the graphic elements of the design, appears to have contributed to the multiple perceptions of the poster. It is especially unfortunate that a poster meant to embrace diversity has raised concerns about possible stereotyping and offense. Commenters have shared how the image evokes a burqa or a niqab. This simply did not occur to us as the design for the poster developed. Our design team included a Muslim woman who wears traditional dress. She was enthusiastic about the campaign and the poster design and we were pleased to work with her on it. We have shared the comments with her and she is surprised that the poster has been interpreted as traditional Muslim dress. We have read and carefully considered all the feedback. We will be exploring alternatives and our future course of action in the coming week with the goal of reaching a resolution that responds to members’ concerns and upholds the values of our association and the profession. We will continue to engage in the robust exchange of ideas that is the hallmark of our values. As always, our goal for Banned Books Week is to highlight the harms of censorship and to promote the freedom to read for all. So they do plan to take some action. But, again, Agnostic, Maybe asks a very important question… if they do respond to the petition and the outcry, how does this look for our national figurehead’s response to censorship? What do you see? What do you think? I will update when their action has been announced over the next few days. I was visited by the Ghost of ALA Future last night. This video of Barbara Striping talking about voting in ALA Elections started playing on my computer in the middle of the night for some reason waking me and my husband up. Needless to say, it was a little unsettling. Professional Confessional: I have not ever voted in an ALA election before. I probably actually can’t at this point because I think I need to renew my membership? Anyway, it was a little like I was Ebenezer Scrooge being visited by the Ghost of ALA Future warning me of the things to come. But i DID vote for the first time in the TLA elections this year! ALA voting begins today and goes through May 1st. Go here to cast your ballot. TLA voting… just happened. Might be over? Honestly I can’t find any dates on their website. Not good. But here is a link to the Members Only area where you would vote if it was still happening. My signed (and doodled) copy of Akata Warrior by @nnedi. Clean blog, clean blog! Move down!